The GSX-R1000 engine was a redesigned GSX-R750 engine. The R1000 had a 1 mm (0.04 in) bigger bore and 13 mm (0.51 in) longer stroke, newly designed pistons with lower crown, and gear-driven counter balancer. The engine weighed 130 lb (59 kg) which was slightly heavier than the 750 engine but 31 lb (14 kg) lighter than the engine of the GSX1300R. The performance of the engine is a peak of 160 bhp (119 kW) at 9,500 rpm, as measured on the crank and 143 hp (107 kW), when measured on the rear wheel with small variations between different instances of the same model. The redline is set at 12,000 rpm. The maximum torque of the engine is 80 ft⋅lbf (108 N⋅m) at 8,000 rpm. 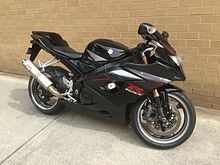 Combined with a total (dry) weight of 374 lb (170 kg) this gives the GSX-R1000 a top speed of 173 mph (278 km/h), a 1/4 mile time of 10.1 seconds at 141.7 mph (228.0 km/h), and a 0 to 100 km/h (62 mph) time of 3 seconds. The 2005 model has a tested wet weight of 444 lb (201 kg). Power output is tested at 147.3 hp (109.8 kW) and peak torque is 75.4 ft⋅lbf (102.2 N⋅m) both at the rear wheel. The 2017 model, introduced to reporters at EICMA in late 2016, had a significantly redesigned engine the first since the last engine update on the 2009 model. This new engine has a higher RPM limit and no balancer shaft to quell vibration, also a mechanical variable valve timing used for ten years by Suzuki in MotoGP and drive by wire throttle. This model is the first to get the addition of traction control with a (IMU) inertial measuring unit measuring yaw, roll and pitch also all lighting is now LED. Another first for any GSX-R is the use of a fuel gauge on this model. Along with the new 2017 GSX-R1000 model, Suzuki has also released a up spec model GSX-R1000R; this R model comes with a Motion Track Brake System, Bi-directional quick shifter and launch control. Also on the R model, as reported by Sport Rider, are the same Showa Balance Free Front (BFF) fork and Balance Free Rear Cushion (BFRC Lite) shock that come standard on the 2016 Kawasaki ZX-10R. Specifications are 199 horsepower at 13,200 rpm (claimed) and 157.2 hp (117.2 kW) (rear wheel), 86 lb-ft torque at 10,000 rpm (claimed) and 76.3 lb⋅ft (103.4 N⋅m) (rear wheel); 76.0 mm x 55.1 mm bore x stroke, and 13.2:1 compression ratio. ^ Parker, James (August 12, 2016). "The Weight Barrier of Motorcycles". Motorcyclist. Retrieved October 4, 2016. ^ Suzuki (2007). "Suzuki GSX-R1000". Archived from the original on November 26, 2007. ^ a b c d e f g h i j "Sportbike Weights and Measurements". Sport Rider. August 23, 2011. Retrieved June 15, 2016. ^ a b "2012 Literbikes on the Dyno". Sport Rider. July 26, 2012. Retrieved June 15, 2016. 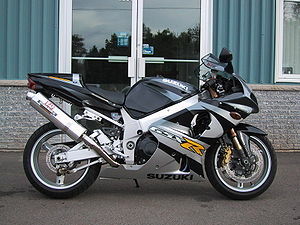 Wikimedia Commons has media related to Suzuki GSX-R 1000.